We hope you are as excited as we are to start the coming school year with fresh ideas for the classroom and a new perspective on teaching and learning. Thinkport has everything you need to make it a stellar year. Here is a sampling to get you started! MPT expanded our educational offerings with 60 new Teaching with Primary Sources Inquiry Kits designed to make historical research accessible and interesting to middle and high school students. Through the examination of primary source sets from the Library of Congress, students learn to engage with people, places and events of the past, and become eyewitnesses to world history. Students using the kits will gain knowledge about everything from early cultures and world powers, to the economic and environmental impact of globalization. To guide students through the research process, the kits include a series of self-paced lessons narrated from a high school student's point of view. Ignite a spark in every student and uncover a superstar in every teacher with Thinkport's literacy-building science activities. Students gain practice with skills including analyzing text, determining the author's purpose in writing, and identifying central ideas of a text while exploring a range of science topics from protecting whales and mass extinction, to tsunami's and the science behind why popcorn pops. Strong reading, writing and comprehension skills are critical for success in school and increasingly important as students enter the workforce. Thinkport's literacy-building lessons and activities help students learn to think more deeply about what they are reading and work with increasingly complex text. Get ready for rich learning moments with activities and media from The Electric Company. Empower students to bring about change and take a stand for something as they write an argument based on the topic of bullying. Students practice close reading, analyze fiction, and find the central ideas in text while reading works of famous authors including Emily Dickinson and Mary Shelley. Math is part of our everyday lives, from decorating cakes and creating sculptures, to playing soccer and designing buildings. MPT’s interactive lessons use real-world scenarios to teach students math concepts including volume, surface area, relative frequency and proportional relationships. Child care providers play a critical role in the early learning and the developmental of children in their care. Thinkport is your one-stop shop to support and bolster activities in your child care program. Get involved in the book contest that's sweeping across America and cast a vote for your favorite novel on the list. 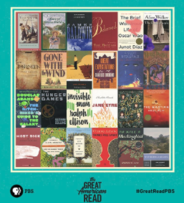 The GREAT AMERICAN READ is a PBS series and multiplatform initiative designed to spark a national conversation about reading, literacy and the books we love. > Learn more and cast a vote! The GREAT AMERICAN READ also provides a unique and exciting opportunity to get students involved in reading some of the classics. Many of the novels that made the top 100 list are woven into school instruction. We have gathered a collection of activities, resources and ideas to deepen student learning and engagement around some of America’s most notable novels and authors. > Learn more and get started today!